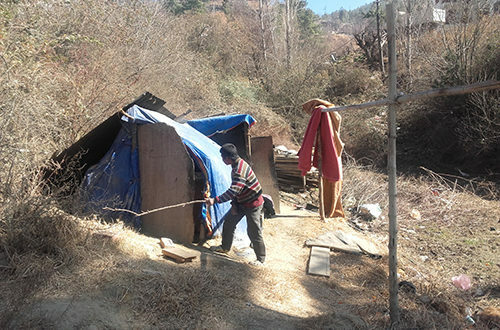 Near a muddy stream in Babesa, Thimphu, is a makeshift hut of plastic and bamboo. It is home to a man in his mid 50s who suffers from a speech disability and one side of his body is paralysed. Several Thimphu residents who have walked through the area, below the road, have come across this man but very little is known about him. What is known so far is that he hails from Tsirang district and his last name is Rai. In a small kitchen beside his shelter, he cooks on a wood-fed stove. After several failed attempts to light the fire, Rai appears to be contemplating and then swings his knife (khukuri) to leave him alone. On the third visit he was in a delighted mood, applying cement and sand mixture surrounding his shelter. He gestured that during the rainy season, water drips inside making his space muddy. He has been taking shelter in the same place for about three years. He pointed towards Debsi to claim two of his children live there and the other two in Thimphu town. He raised his numb fingers to indicate that it was seven years since his wife passed away. He gestured that few people visit him and donate ration and basic necessities. One visitor is Kinley Wangchuk. “I did not notice the shelter before even though I drove through this road several times. “I came walking this way and I saw a good number of people gathered here,” he said. The other visitor, Tshering Wangmo, 32, suggested that he be handed over to hospital or an old age home. “How long can he cook for himself?” she said. Rai makes it clear that he has been residing in Thimphu for 30 years and worked for the government before.